With the ability to establish an electronic data feed to over 15,000 financial institutions, the employee trade monitoring feature automates the submission and tracking of personal securities holdings and transactions for RIA firms of all sizes. 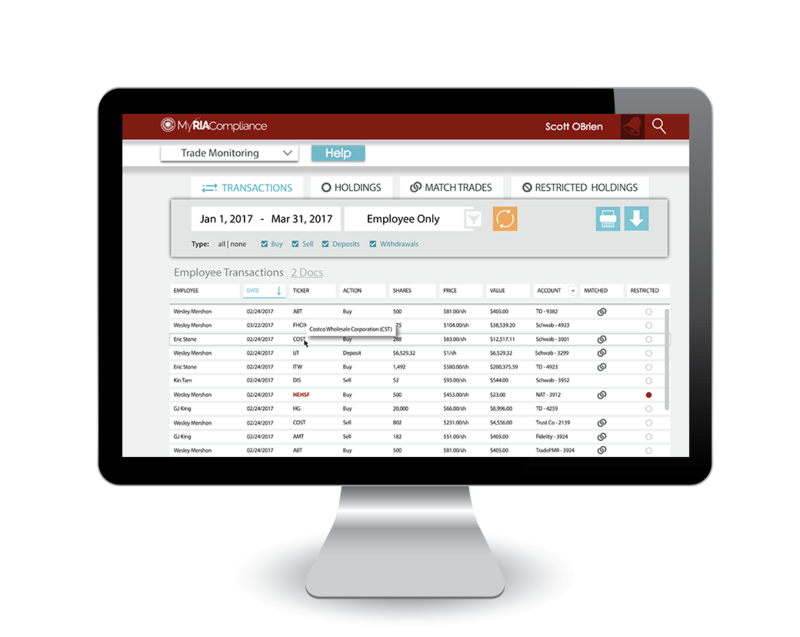 The Chief Compliance Officer gains access to detailed reporting tools and the ability to manage a restricted securities list. Does the system create access person holdings and transactions reports? Yes, the tool is designed to help a firm meet its Rule 204A-1 ("Code of Ethics Rule") requirements as it relates personal securities trading. The Code of Ethics rule requires all access persons of an RIA firm to submit securities holdings and transaction reports to the firm's Chief Compliance Officer ("CCO") or other designated person(s). The system automatically creates holdings and transactions reports which are then reviewed and attested to by the firm's access persons prior to submission. Does the system allow the Chief Compliance Officer to manage a restricted securities list? Yes, the restricted securities list is fully customizable for firms that implement a trade pre-clearance program. When implemented, each access person submits a trade request which is then automatically approved or held for approval based on the firm's settings. In addition, any security purchased or sold by an access person that is listed on the firm's restricted security list is flagged by the system for further review. All historical restricted securities are archived. Do you have a stack of employee brokerage statements waiting to be reviewed?